When I was a student in the late 60s, Rattigan only got a passing mention in theatre history (well-crafted, conventional) which was better than Christopher Fry or T.S. Eliot who weren’t mentioned at all. 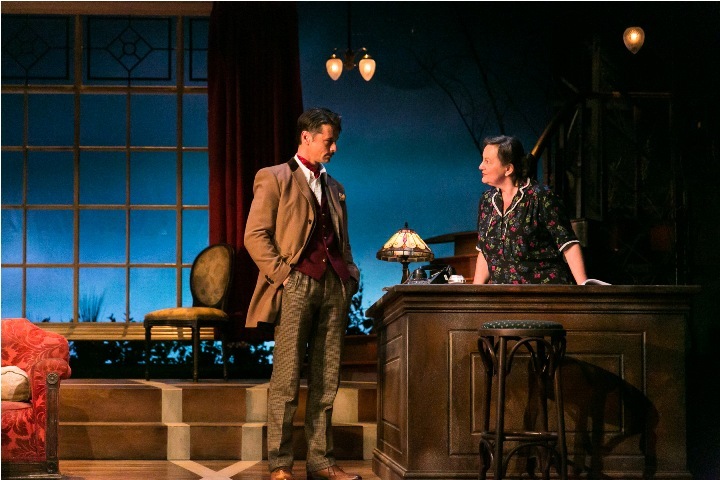 I don’t much like Rattigan, except that last year’s Separate Tables at Salisbury was truly superb, but then it was a home-grown production in the round. 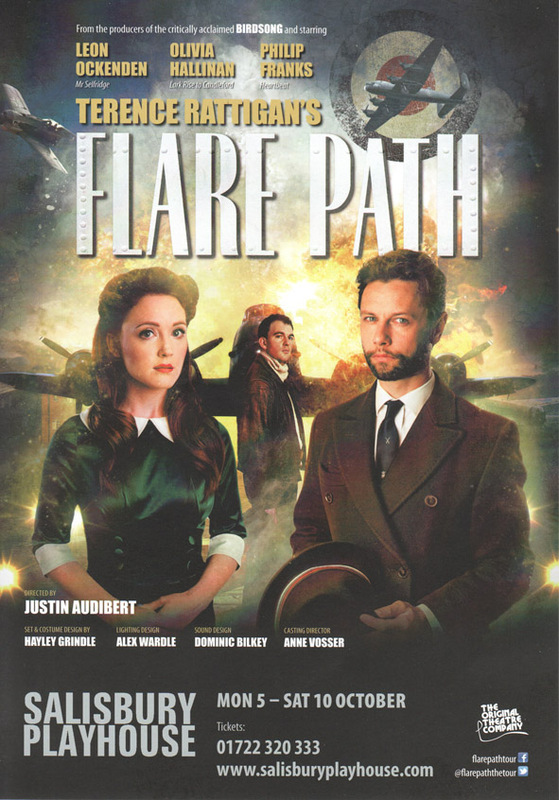 Flare Path is on a major tour, and playing prestige theatres too. I have seen it before, at Poole in the days when they did five plays for the price of four or whatever and it was the fifth. It’s early Rattigan, produced in 1942, and as he served as an air gunner, the RAF in World War Two is a setting he knew. 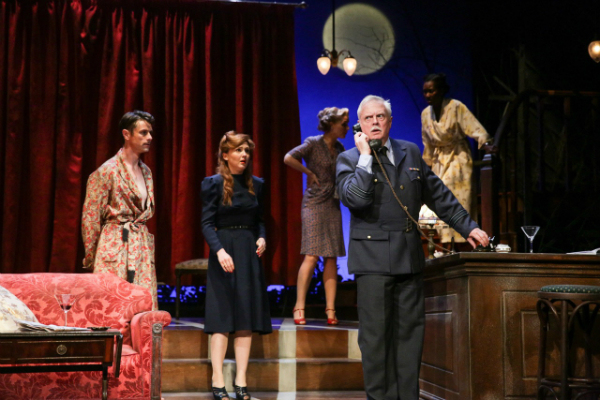 The play is about wives waiting for air crew in a hotel next to the aerodrome in Lincolnshire. It centres on an eternal triangle, when Peter Kyle, a British Hollywood film star, turns up seeking his old flame, actress Patricia Warren. Patricia is an actress who used to “live in sin” (the script says this) with Peter Kyle in America. She’s now married to war hero Flight-Lieutenant Teddy Graham, DFC of Bomber Command. Peter wants her back. They call each other ‘Pete’ and ‘Pat’ with excruciating frequency. I didn’t like the play last time around. Since then I’ve read Patrick Bishop’s Bomber Boys and I know that the crews of Bomber Command were on a 50 / 50 chance of surviving a thirty bombing raid tour, so worse life expectancy than infantry officers in the World War One trenches. Post-war guilt over Dresden and Hiroshima meant they were never given the deserved praise of fighter pilots in the Battle of Britain either. Southampton, its centre destroyed in 1940, is one of the few cities to celebrate OUR bomber boys with a statue of “Bomber Harris.” If you’d studied maths or physics after the age of 16, and had decent eyesight, the chance of being put into Bomber Command was very high. It has been said that Britain’s drop in manufacturing and technology after World War Two was fuelled by losing so many of our best mathematical and scientific lads in bombers. A couple of hours with the book Bomber Boys is more illuminating (and entertaining) than two hours with Rattigan. A glance around the matinee audience. I’m a post-war baby boomer, and we had enough tales of the RAF for me to know a Wellington bomber had two engines and a Stirling bomber had four. Important information in this play. A lot of the matinee audience were in their 70s. Some 80s. Maybe a handful in their 90s … and only the last group would have experienced “the war” as we called World War Two as adults. But the older you are, the more you would have been indoctrinated in the period. Suffice it to say that the considerable applause at the end was punctuated by ‘Bravo!’ rather than ‘Yea!’ or whooping. The play has more minuses than pluses. Rattigan was terribly proud of his air force vernacular … lingo … slang … idiolect. It dates it horribly. I knew that a Wimpey was slang for a Wellington. I made the Airfix model plane when I was twelve, but I doubt that many do. You’re supposed to know. Wiki tells me that in the first 1000 bomber raid, in May 1942, 599 out of 1046 aircraft were Wellingtons, and 101 of them had Polish aircrews. The play was written in 1941, performed in 1942, a major success in 1946. As such, it is propaganda. Patricia has to realise that She Has Been A Fool (my caps) and that “Pete” Is Not Worth It (my caps). When poor Teddy tells her of his “funk” (not of the musical nature, but “fear”) he becomes vulnerable, and she realizes she must reject Shallow Pete. It’s all a bit “You must do your duty by the fighting men, gals.” The wives waiting for the chaps to return from a mission so as to “spend the night together” has an uncomfortable “Troop up the wooden hill to Bedfordshire” aspect as they arrive which is akin to a brothel. The dated aspect is compounded by the two lead roles. Patricia (Olivia Hallinen) and Peter Kyle (Leon Ockenden) have the unenviable task of being actors who are playing the roles of actors who have to make it obvious with every move that they are professional actors who can’t stop acting. 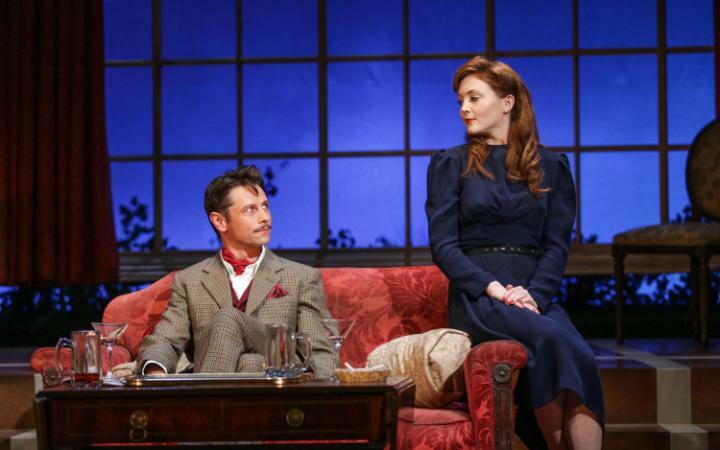 Leon Ockenden achieves this by shouting loudly in rather wooden Advanced RP, while Olivia Hallinen does rather better by adopting studied and fixed 1930s film star poses and stances and facial expressions, and definitely looking exactly the part. They’re supposed to be Over The Top, but the line gets blurry. It might work if the rest of the cast were reasonably naturalistic in contrast. They’re not. No one could be with this text, so they’re forced into being “more actor” than everyone else, and that takes some doing. The second half shows the women and the Squadron Leader waiting for the chaps to take “orf” from the aerodrome, and fly over the drink to thrash Jerry, then awaiting their return to Good Old Blighty. Will they all get home? When Teddy gets back after a dreadful flight, they still don’t know about Count Jonny, the Polish officer. There are lines in there such as “He’s the whitest of men” that you just have to drop in 2015. Especially with an Afro-Caribbean actress as Mrs Miller. The best part in the play is Doris (Siobhan O’Kelly), the barmaid who became a countess. It should be … Sheridan Smith did it in the acclaimed 2011 production (not the one I saw) and she knows which part to go for. I thought the billing odd … Alastair Whatley’s Funky (in the 1942 sense) Flight-Lieutenant and Doris stood out as the best performances to us. Flight Lieutenant Graham having brought the shaky kite of a wimpey bomber back through the flak, breaks down with what we’d now call Post-Traumatic Stress, though in 1942 you just ran yourself under a cold tap. Rattigan, like Coward, just cannot write working class. 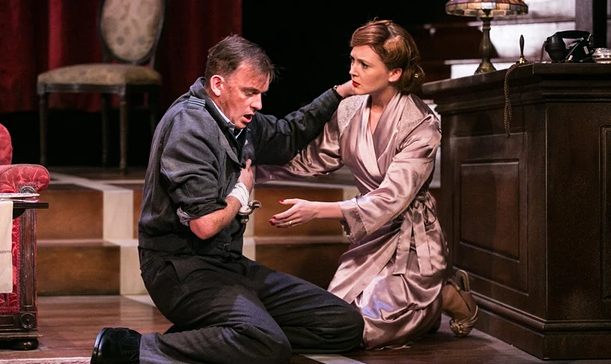 In this play, I’d add he’s not much good at dialogue either, which is somewhat of a drawback for a playwright. The Dusty Miller / Mrs Miller Cor-Luv-A-Duck Guv Salt Of The Earth couple are patronizing writing of the worst order. Full marks to the actors here for making it sound moderately sensible. Mrs Oakes is patronizing writing too, but she does have funny lines, and Stephanie Jacobs did them extremely well. The set is elaborate, way better than last time I saw it. The women’s costumes excellent, the men’s poor. Uniforms … the Flying Officer, Flight Lieutenant and Squadron Leader appear to have the same rank bands around their arms. That is surely wrong. Teddy’s jacket is too short. Sergeant Miller’s is too big. And Leon Ockenden is too young for his role, and Philip Franks too old for his (though in this cameo, his innate ability leaps out). L to R: Peter Kyle in PJs, Patricia, Doris (rear), Squadro Leader on the phone, Maudie Miller. 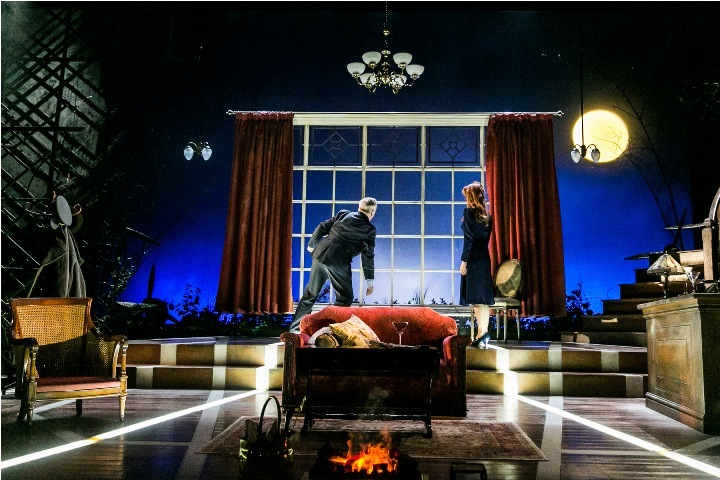 In the end, in spite of its sentimental glow, it is intrinsically an awful play. The plot has its moments, there’s a very good basic idea, and the heroism of Bomber Command has for too long been unstated, but you’d need a degree of distance to do it justice, not a patriotic piece from within the era. You also need to be able to write believable women, not cardboard cut-outs. But … 100% bums on seats on a Thursday in Salisbury and a happy audience. You can’t argue with that, even if my companion described it as Care Home Drama. Kinder to say it’s a nostalgia trip … stylistically, rather than the story. Why on Earth is Leon Ockenden presented in publicity with a beard, which no David Niven lookalike Hollywood actor would have worn in 1942? He’s had his moustache and hair done properly for the production, but why so “wrong” for the publicity photos? It Ain’t Half Hot Mum … Perry & Croft would certainly have known this play. Gunner Beaumont (Melvyn Hayes) is “Gloria” just like the Squadron Leader (Swanson) and La-De-Da Gunner Graham (John Clegg) plays piano.